More on all-malt Michelob, mentioned last week. 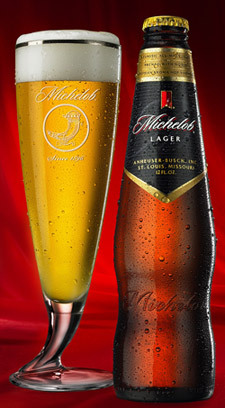 The new Michelob and Michelob Light will be available Feb. 26 and the AmberBock March 5. You won’t have any trouble spotting the difference, because of new packaging. Anheuser-Busch is bringing back the teardrop bottles (but not for the AmberBock) it used between 1961 and 2002. The teardrops were introduced in 1961 when A-B began brewing Michelob with rice. Both the bottle and the new recipe were meant to symbolize elegance, with the rice making Michelob a lighter, crisper beers than others on the market. Michelob owned the “super premimum” segment then, as imports accounted for only 1% of American beer sales and microbreweries didn’t exist. Lew Bryson writes that these beers are aimed to appeal to the same consumers who drink craft beer – one of the definitions of craft beer is that it doesn’t contain rice or corn (sugar and other wacko ingredients are another matter). That’s obvious even with the redesigned bottles, which feature the embossed lettering that will seem familiar to those who buy products from New Belgium, Samuel Adams, BridgePort, Deschutes and a host of others. What’s with the new Michelob Light? It taste more …. like an ale???? Maybe similar to a (very weak) Indian pale ale?? I have not seen any advertising or any blogs on its new taste or its non-twist off top. Please tell me if Michelob is brewed with only water, barley malt, yeast, and hops. I’m confused on whether or not you currently use rice or other indgredients. Thanks in advance. Michelob is brewed with malted barley, water, hops and yeast. That’s all.